Mopane Bush Lodge is a Limpopo lodge situated in the far north of South Africa next to Mapungubwe National Park. Mopane Bush Lodge offers guests the opportunity to enjoy the great outdoors and all the wonders of the Mapungubwe National Park. This scenic national park boasts a World Heritage Site and panoramic views of the Limpopo River. At Mopane Bush Lodge the thatched chalets each have their own kraal (mopane pole enclosure) with scenic uninterrupted views. 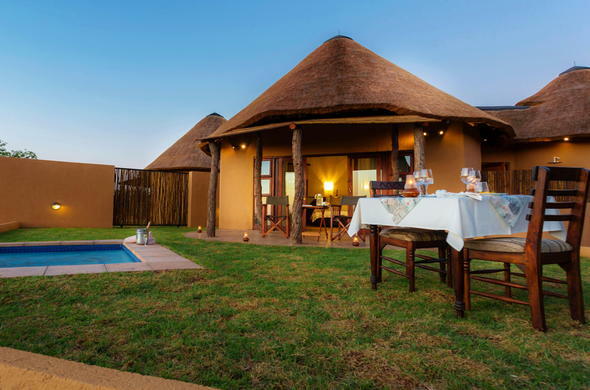 The chalets, bathrooms and facilities at this Limpopo safari lodge are wheelchair-friendly. This Limpopo Lodge features a swimming pool to cool off in, a comfortable lounge with small library, a fireplace and a full bar. Excellent international cuisine is served at Mopane Bush Lodge. Enjoy your meal in the dining room, in the boma (outdoor enclosure), around the pool or on a picnic while exploring the surrounding area. This Limpopo lodge has many activities available for guests to enjoy, from walks to game viewing and tours to many attractions in the area like the Mapungubwe World Heritage Site, home to the first African Kingdom in the 13th century. Guests can safely venture out with their vehicles or bikes and also walk in the Mapesu Reserve.